Question1: Do we know that sales development raises revenues? The value of a sales development effort is measured by increased won business per account executive and/or accelerated new customer acquisition. If you increase lead conversion rates, but you aren’t closing more business, what’s the point? Similarly, if your account executives are having twice as many introductory meetings, but aren’t closing more customers, you’re just spinning your wheels. As a first step, we need to determine if SDR-supported Accounts Executives (AEs) are indeed more productive than AEs without SDR support. Based on our data, the answer is yes. 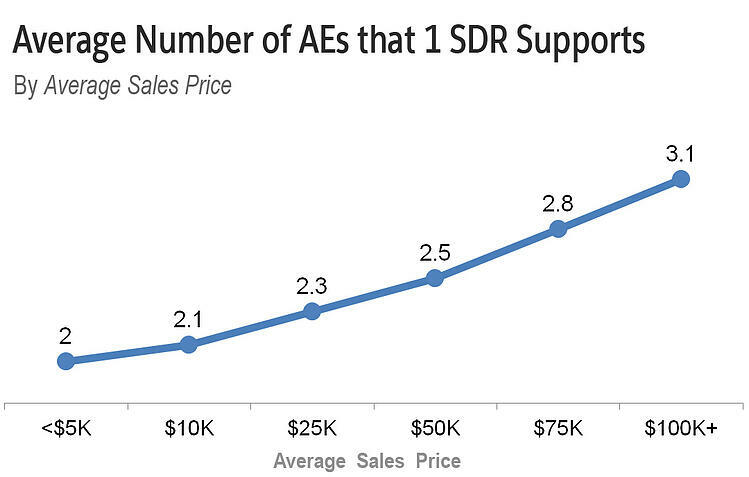 On average, AEs are made 16% more productive with SDR support. At lower ASPs, the uplift is more modest. While at the higher end, it exceeds 20%. The net is clear: SDR-supported AEs are more productive. This is a good start. 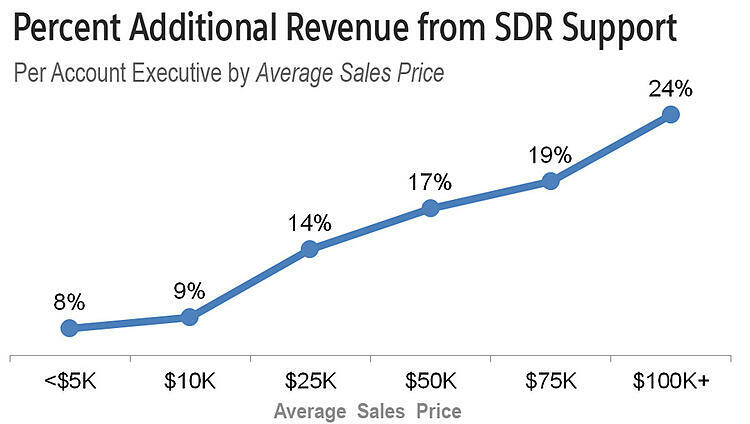 We know that the SDR can be profitable, now we just need to figure out when. Question 2: How much does one SDR cost? 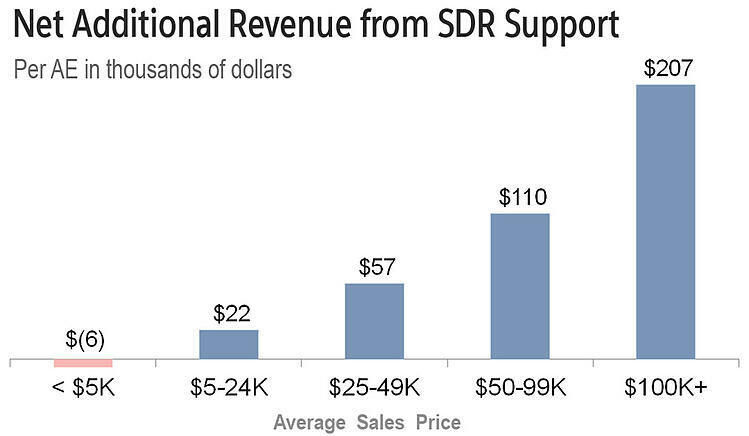 As a first step, I used our SDR Compensation Calculator to determine on-target earnings. I added in 1/8th of a fully-loaded Manger’s compensation (the average ratio is 1 Manager to 8 SDRs). On top of that, I estimated the spend on enablement technologies, skills trainings, healthcare, taxes, HR, and other benefits. This gave me a range of $106-$141K for fully loaded SDR compensation. 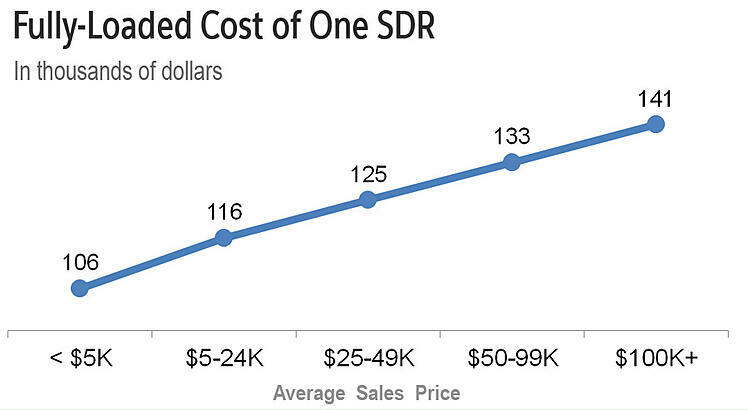 Now we know what one SDR costs. 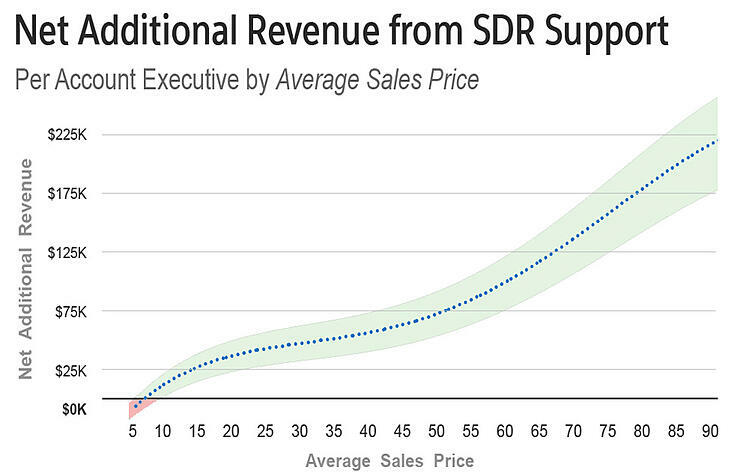 But the vast majority of companies don’t have a 1-to-1 SDR-to-AE ratio. Figuring that out is our next step. Question 3: What are the SDR-to-Account Executive ratios at different ASPs? Question 4: By how much does additional AE productivity exceed SDR cost? To this point, I’ve been using the average productivity gain from sales development support. Obviously, there is a ton of variation here. I re-ran the numbers at 85%, 100%, and 115% productivity to illustrate the range. NET NET: What’s the minimum ASP where sales development makes sense? Our ranges (85%, 100%, and 115% productivity gain) intersect the no return line between $4K-$11K average sales price. I don’t want to dissuade anyone from building sales development. The lesson to be learned here is that the difference between positive/negative ROI at lower ASPs is how effectively you execute. I’d love to hear how you’re measuring SDR return. Please let me know what you’ve seen in the comments.